Remote Management allows you to manage the router from a remote location, via the Internet. Managing a Linksys router from a remote location is similar to accessing it locally. The main difference is, instead of typing the router’s LAN IP Address in the web browser’s Address bar, you have to type the router’s Internet IP Address. Enter the port number that will be open to outside access. The default setting is 8080. This port must be used when you establish a remote connection. NOTE: Before proceeding, make sure that the router is configured and computers can go online when connected to it. To begin enabling Remote Management, follow the steps below. NOTE: If the Remote Management feature is enabled, anyone who knows the router's Internet IP Address and password will be able to alter the router's settings. NOTE: If you are using Mac® to access the router's web-based setup page, click here. When the router’s web-based setup page opens, click Administration. 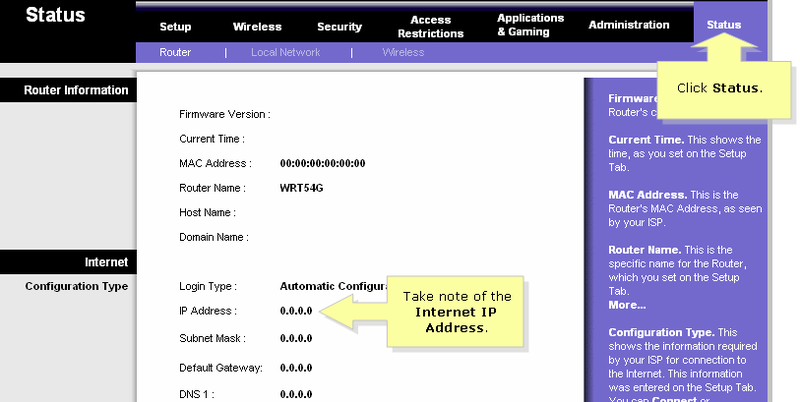 NOTE: If the screen on the router’s web based setup page looks different, click here. Change the router password for added security. For instructions, click here. Look for Remote Management and click Enable. Click Status and check the router’s Internet IP Address. Using a computer that’s connected to the Internet from a remote location, launch Internet Explorer and type “http://0.0.0.0:8080” (the 0's represent the router's Internet IP address, and 8080 represents the specified port) on the Address field. NOTE: The 0’s represent the router’s Internet IP Address which you took note earlier. If you're using Mac, open Safari and type “http://0.0.0.0:8080” on the Address bar then press [Return]. A new window will appear and will ask for a User name and Password. 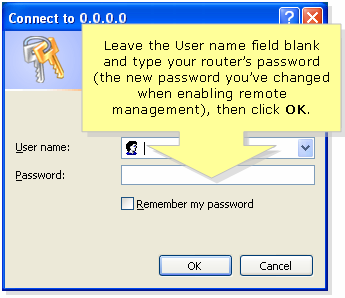 Leave the User name space blank, type in your router’s password (the new password that you’ve changed when enabling remote management), then click OK. If you're using Mac, leave the Name field blank then type in your router’s password (the new password that you’ve changed when enabling remote management), then click Log In. You should now be able to access the router’s web-based setup page.